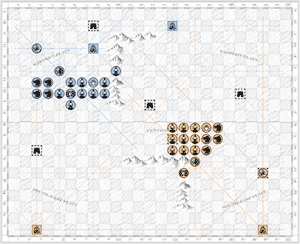 Click to enlarge "This Kriegspiel, or war game, brings into play the operations of two armies of equal strength, each seeking, through manœuvre and battle, the destruction of its adversary. Each is at the same time obliged to protect, within the territory it occupies, the resources needed for effective campaigning, and to keep its lines of communication open." The game is played by two players on a game board of 500 squares arranged in rows of 20 by 25. 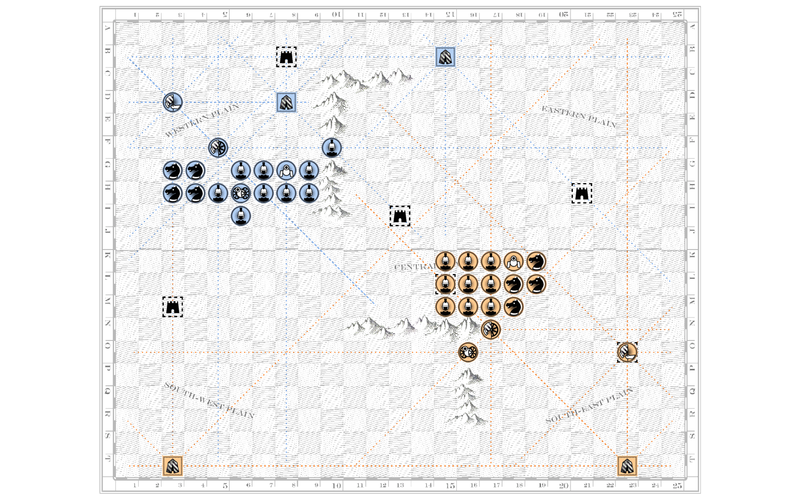 The board is divided into a northern territory and a southern territory, each with a single mountain range of nine squares, a mountain pass, two arsenals, and three fortresses. Each player has a communication network that must be maintained and protected. The network is powered by the player's two immobile arsenals, which radiate lines of communication vertically, horizontally, and at 45º diagonals. Each player also has two mobile relay units, which reflect any line of communication aimed at them. Friendly units must remain connected to the network, else risk being captured. Lines of communication can be severed by the enemy and thus are crucial to strategy. The object of the game is to destroy the opponent, either by eliminating all its forces, or by destroying its two arsenals.